The Rockport Film Review: The Adam Green Trilogy #2 - "Spiral"
The Adam Green Trilogy #2 - "Spiral"
After his breakthrough horror splatter hit “Hatchet” Adam Green teams up with friend Joel David Moore to write and direct the suspense drama “Spiral” which also stars Moore in the lead as “Mason” as an intensely quiet and withdrawn painter who works at an insurance company call center. This movie is quite the departure from the blatant blood and gore of his previous film. “Spiral” is really a hard film to classify. It’s not really horror, but more of a character drama that happens to have an overall theme of terror. It’s also about the nature of friendship between two friends. Zachary Levi (who now plays “Chuck” on the NBC show) is Mason’s longtime friend Berkeley who knows Mason has some serious issues. There is also Mason’s relationship with women, Diana in the beginning and Amber (Played by Amber Tamblyn) for the majority of the movie. The movie continues to tease the audience as to whether Mason is a killer or just an average guy dealing with some pretty heavy emotional issues. Mason appears to be a very meek and neurotic guy. He lives alone in an apartment where he paints portraits of women who pose for him. Is Mason as benign as he looks or is there something else brewing inside his tall, lanky body? Joel David Moore’s portrayal of Mason is pretty dead on and definitely makes this movie what it is. Zachery Levi is also very strong as the friend who is really in denial that his friend really needs professional help. Amber Tamblyn’s character of who else Amber is probably the weakest of the three but in a movie as well acted as this one, she still does give a decent performance. What does she see in Mason anyway? 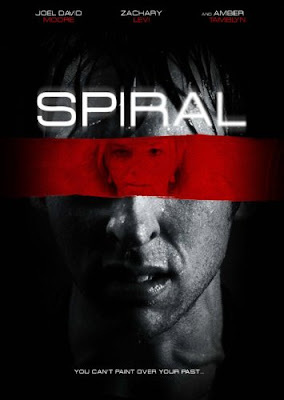 Spiral builds to a suspenseful and sort of obvious climax, but when Mason goes to Berkley for help after an “incident”. The rug is pulled out from you in a brilliant “oh my god” twist, but is it the truth or is it just what Berkley wants to believe. He then comes to the realization that Mason isn’t quite what he appears to be. The Adam Green Trilogy #3 - "Frozen"